"There's a reason Burntside made it into the travel book 1,000 Places to See Before You Die. This truly is the best Minnesota has to offer." What is now known as Burntside Lodge began as a hunting camp in the early 1900's during which time part of the main lodge was built. In 1910 the property was operated as a Sportsmen Club by local businessmen. The Burntside Outing Company began business in 1911 and was comprised of pioneering Ely merchants Thomas E. Miller (Indian agent and owner of a mercantile, P T Brownell (owner of the meat market), Peter Schaeffer (owner of the local newspaper), James White (banker) and others. 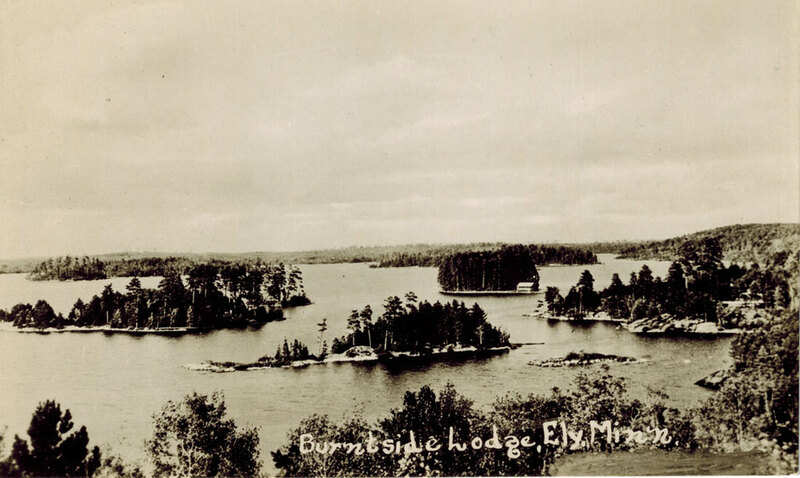 They recognized the beauty and uniqueness of the land and had the vision to develop the lodge and situated it perfectly with spectacular sunsets and lake views. In 1915 the outing company constructed a large boat house in the bay and a large dock. A Mr. Erickson was hired and was ready to rent boats and canoes. In the 1920's William Alden arrived and worked his way into the management of the resort, eventually purchasing it. Several years later his brother, Lyman, who was in the lumber business in Minneapolis, joined him in the operation of the resort. During this time they expanded the resort adding more cabins. A brochure from 1922 indicates there were 16 cabins. In the 30's another brochure indicates there were 28 cabins and lodges for the conveniences of guests. Guests included doctors, lawyers, bankers, manufacturers, merchants, school teachers, salesmen, engineers - families seeking relaxation in refined surroundings. They came from all over - as far away as California and New Jersey. The activities offered were many: fishing, hunting (bear, deer, duck, and partridge in season), golfing in Ely, tennis, and relaxing at the beach. Meals were advertised as “those that will always be remembered with a relish.” The finest of home-grown and imported foods were served under the supervision of an experienced Chef. Chicken, duck, steak and fish dinners were a specialty. To stay back then it cost roughly $5.00 per person, per day on the American plan. Employees came from throughout the midwest. One of the employees Willy hired was a woman named Bessie King. She worked for several summers and with what is remembered as ‘encouragement by the guests’ they were married in 1925. They ran the resort together for the next 16 years. In the early 1930's a young Ray LaMontagne, arrived from Duluth to work as a bookkeeper for Mr. & Mrs. Alden. Working as a summer employee he developed experience and an attachment to the resort. Returning home at the end of the summer to his studies he married Nancy Cargill in August of 1937. Not forgetting Burntside they even came to the resort on vacation. Ray was employed as an accountant in Duluth, happily married, and involved with friends and family. In June of 1941 one of the largest and most prestigious visits to Burntside was the Midwest Governors Conference. This visit brought the media and much attention. Chartered buses brought the party to the area; a luncheon was served in the main lodge. News reel camera men from the Associated Press, Paramount, Fox and Universal photographed the Indians wearing full tribal regalia and the staged pow wow. It was quite a credit and accomplishment to host this prominent group. Bessie Alden became ill and died in August of 1941; Willy must have felt that he could no longer operate Burntside. He approached Ray at the end of the season at which time Ray and Nancy LaMontagne purchased the resort. In their 42 years of active management their contributions were many. In addition to raising their family of two daughters, Ann and Noel, and son Lou, they operated the resort through World War II and times prosperous and lean. Indoor plumbing was brought into the cabins and new cabins were built while others were modernized and improved. The Trading Post was a popular place for the young with music, dancing, lunches and beverages. Guests from these days fondly remember the island breakfasts, steak fry cookouts, smorgasbords, shuffleboard, bingo in the lodge and skits offered by the staff. In 1983 Lou and his wife, Lonnie, began the management of the resort with their own young family. In June of 1988, Burntside Lodge was officially listed on the National Register of Historic Places. The resort has been given appreciation in many recent publications such as Wine Spectator, Fodor’s, Midwest Living, Minnesota Monthly, Mpls/St Paul, Country’s Best Log Homes, 1,000 Places to See Before You Die, Country Home Magazine, Outside Magazine and others. The resort’s historical value and charm remain preserved. Guests return each summer filled with reflections of earlier visits. All agree “You haven’t been until you’ve been to Burntside” and once you’ve been, you’ll always remember this lodge on the lake. The resort offers guests the opportunity to relax and unwind, to rejuvenate and connect with nature in a cabin that has the history that Burntside offers with comfortable accommodations and genuine northwoods hospitality. We welcome you to come and be part of the tradition.